On Tuesday, September 4, 1962, the Beatles recorded their first track as EMI artists at Abbey Road Studios. It was a song entitled “How Do You Do It”, written by Mitch Murray and forced on them by their new producer, George Martin, who believed it would be a hit single. 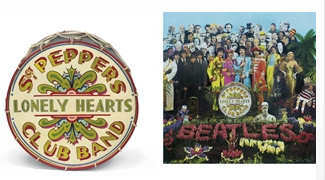 Pictured right: The Beatles – The legendary hand-painted bass drumskin used on the front cover of the Beatles’ ground-breaking 1967 album Sgt. Pepper’s Lonely Hearts Club Band. Sold for £541,250 ($1,071,133) at Christies, 10 July 2008, London, South Kensington. It was – a year later, for Gerry and the Pacemakers. Instead, their other recording effort that day became the Beatles’ first single. Written by John Lennon and Paul McCartney, it was called “Love Me Do”. Seven and a half years later, on January 4, 1970, they recorded their last song together as a group, the entirely appropriate “Let It Be”. During those scant few years, the Beatles became the dominant cultural influence of the last half of the 20th century. Pictured left: The Beatles – A programme for The Beatles US Tour, 1965, signed on the cover in blue ballpoint pen by all four Beatles, additionally inscribed in an unknown hand To Tommy, in common mount with a programme for their 1966 US Tour and a The Beatles Conquer America souvenir booklet, overall measurements — 14×39½in. (35.5×100.3cm.) framed. Sold for £13,513 ($22,444) at Christies, 1 October 2003, London, South Kensington. Beatlemania left an avalanche of collectibles in its wake. Photos that were signed by all four members can range in value from $2000 – $5000, depending on the item signed. Original sealed albums, particularly those in mono (monaural), are highly desirable. 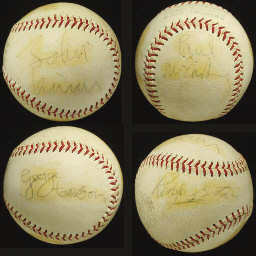 Pictured right: The Beatles – An Official American League (Cronin) baseball signed on separate panels by all four members of The Beatles including John Lennon, Paul McCartney, George Harrison and Ringo Starr, in blue ballpoint pen. A light coat of shellack covers the signatures. Sold for £49,0000 at Christies, 30 November 2007, New York, Rockefeller Plaza. For example, a sealed, mono copy of “Something New” from 1964 is worth $1000 – $1200. 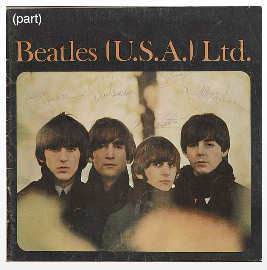 A stereo, sealed version of “Rubber Soul” from 1965 will sell for $900 – $1000. An unused concert ticket can sell for $200 – $300. The Beatles were ideal for merchandising, and there’s some odd stuff out there. 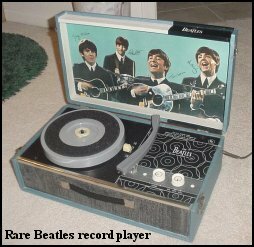 A portable Beatles record player from 1964 in mint condition is worth $8100 – $9500. That same year, Milton Bradley released a board game called “The Beatles Flip Your Wig Game”. In mint condition, it now sells for $300 – $400. 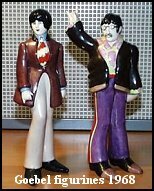 In 1968, Goebel brought out a limited edition set of porcelain figures from “Yellow Submarine” of Lennon and McCartney. Only 100 sets were made and these will sell for $8600 – $10,000. Even newer items, such as the late George Harrison’s 1980 autobiography, “I Me Mine”, can be pricey. 2000 copies with brown leather covers, signed and numbered, were released at the time, and are now worth $2300 – $3000 a piece. 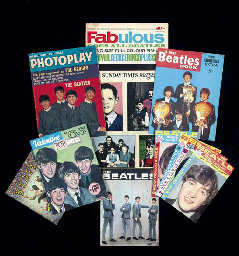 Pictured left: The Beatles – A collection of approximately 42 publications all featuring The Beatles including magazines, booklets, song sheets and programmes. Sold for £264 ($501) at Christies, 21 November 2006, London, South Kensington. Collectibles featuring the Beatles have continuously risen in value and will likely continue to do so for years to come. The memories, however, are priceless.